We all know how important drinking water is, right? If you are not properly hydrated, it will cause all sorts of problems from headaches to fatigue! Our water intake can sometimes slow down in winter, because we don’t feel as thirsty. But, this is really a time to make sure you are drinking enough. The heating in your home or office will dehydrate you more than usual. Drinking lots of water will also combat the dry winter skin! I like drinking water with stuff in it. It tastes really lovely and makes it a bit more interesting. 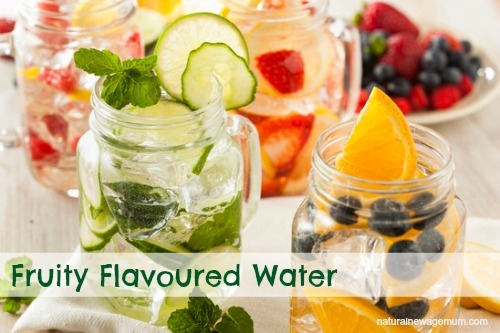 Basically, you just add whatever you like to your filtered water, using a wide mouth jar or jug. You can squeeze or muddle your ingredients if you want an intenser flavour. Chill it for a couple of hours to get the flavours going. Keep it in the fridge so it stays nice and fresh. It looks really impressive when guests come over too. You can even freeze fruit or mint in ice-cube trays to serve with it. The one I have made up at the moment is orange, mint and cucumber – very refreshing! We also like to make up herbal tea and chill it for a refreshing iced tea. A rough guide to how much you should drink each day is 30ml per kg of your body weight. Another way to make sure you are drinking enough is to check the colour of your urine. Clear urine (apart from the first wee of the day!) means you are on the right track. Do you drink enough water? How do you make sure you get enough? Great post! One of the things I do is get a nice bottle to keep on my desk and this makes sure I drink when I am working because sometimes I get too busy and forget to go and get a drink. I love lemony water, but I will try some of these other ideas. Thanks. that’s a good idea – if you see it, you will remember it! Both of us are shockers for not drinking enough water. Thanks for the great suggestions! We must also pop a lovely bottle or jug out as a reminder of what we need to drink. it really makes a difference to how I feel if I drink loads of water!